Bill and Mike's incredible fishing. I've wrecked my back, probably swinging my bag onto my shoulders, so no fishing in the past week. However, my pals keep me updated about what's going on and I've cobbled together a couple of emails from Bill, one of my fishing mates, which may be of interest. Bill has only fairly recently got into lure fishing for bass and hadn't caught too much earlier this year but it's obvious he's now getting the hang of things. I've had a good day for a change. I met Mike (another Mike) at 0530 to our appointed place having only a few casts on the way (strong willed stuff! ).At one point I stripped down to my pants & waded around the cliff (the water was up to my chest) and walked more than fished along to the beach. After a few Redgill casts from the gravel, which was packed with stinking weed, I swapped to a storm shad which I could cast a little further. It was about 0700 by now. First cast, a definite pluck. Second cast another. Third cast wallop. 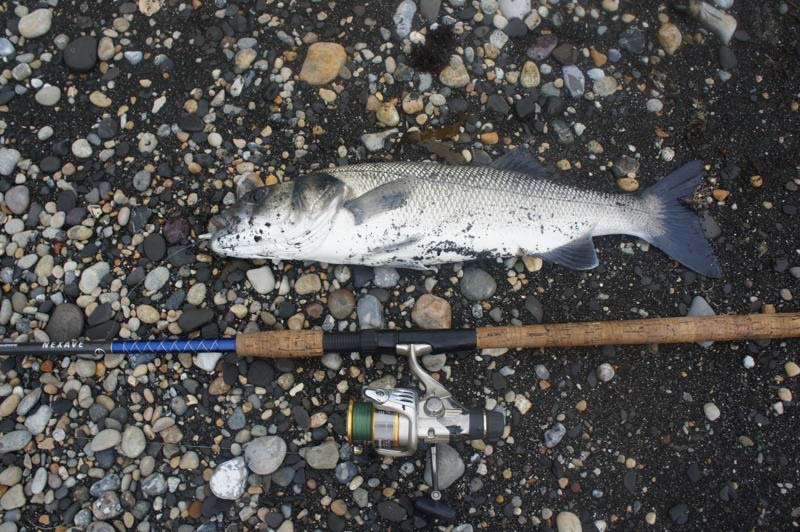 I managed to beach a 3lb 10oz fish (Mike had scales), well chuffed!!!!! The fish was returned and didn't look too happy to start off with but finally managed to get his/her belly down and swim off. We continued to fish the beach for a while but no further bites. I am convinced if we had arrived an hour earlier we would have had a LOT more fish. Do you think its the time of day or state of tide or a combination of both? We fished for another 3 hours. At about 1000 ish Mike then caught 3 schoolies at the headland. I went into a fishing frenzy swapping from shad to plug, to Picoleau to Toby, but no futher luck. We then took the long walk back fishing as we went, no further action to report. Sorry for all the photos but I've had such a great day I hope you will be interested in some of the pictures. Needless to say after their success the lads had another go a few days later. We got around to our spot at about 0815 this morning, only an ankle deep wade this time, you wouldn't find it a problem at all. We walked & fished to the headland, Mike was ahead a fair way whilst I mucked about with a popper. As I rounded the headland Mike was beckoning madly, I think he had caught three fish in the space of 10 minutes. I put on a plug, Picoleau and shad, thrashed the water with my lures and watched Mike continue to catch fish. I finally switched to his tactic and swapped to the trusty Redgill and was into a fish almost straight away. The rain clouds came over and it bloody well pi$$ed down for an hour, but we continued to catch fish, after fish, after fish.After an hour or so things went quiet and we continued to spin over high tide, the quiet spell lasted for about an hour(?). After high water things picked up again and it seemed like we were catching fish almost every other cast. After another spell of hectic action things went quiet again. Mike's tally was 19 fish, mine was 17 so THIRTY SIX bass in total between us. What a day, my best ever day's fishing!I'd say that only two fish were under 2lb and maybe half a dozen at 3lbs, 4 with real imagination.We both kept a fish apiece, the rest were returned. I kept a 2 pounder as the hook had exited through the nostril and then ripped down the fishes snout which was bleeding quite badly. The wade back was a bit slippery with small waves at knee and thigh height but still quite manageable. Sorry for all of the photos again, I'm sure you must be sick of photos of bass but, after all the blank trips I've had, today has made my entire season!. I can hardly believe that it hasn't just been a dream. If you ever fancy a gentle wander and wade let Mike & me know! You said that the trip would be a bit too much for you these days but I say rubbish.....I've seen you run when the rocks are falling from the cliff, and beside, Mike, who is too fit for my liking, could always give you piggy back if you did get knackered. Of course Bill couldn't resist and he had another go. This time alone. Really liked the photos of the fins, how frustrating to see fins but not catch fish. Shame about the prawns, would fish ever take an Idotea, or would one in a sea of thousands be pointless? I don't know whats happening with my fishing lately, after so many blanks I've had two amazing trips on the trot. Today I caught 14 bass. Two were small, 11 were in the 2 to 3lb range and one was BIG. It was pi$$ing down when I arrived at the car park at 0930 this morning and the rocks were very slippery as I walked along at a fast clip. The water was only shin deep & the sea calm so it was very easy. I started to fish at about 1045. In the process of catching four or five bass in the two pound bracket I lost 2 Redgills and was down to my last two. I cast out 25m and thump. As soon as the 'gill' hit the water I was jammed into something solid, not weed. Worried about my dwindling Redgill supply I stripped to my skivies and swam out. It was quite deep on the way out, and I was well out of my depth, but the lure was jammed into a ledge only 3 or 4 feet deep. I had to go under to retrieve it and swam back to the beach, Redgill held high, and continued to fish. My rescued eel immediately caught a small bass, I was a bit surprised as I thought I may have frightened the fish away with my pants. The very next cast I hit something far more substantial. I had the clutch set pretty lightly so the 2 and 3 pound fish could take line if they felt like it. This fish went sideways along the beach as if the clutch didn't exist! I tightened the drag considerably, followed the bass along the beach and turned it towards the shore. As it came towards the beach all I could see was a big tail a humped back and, every now and again, a massive mouth. 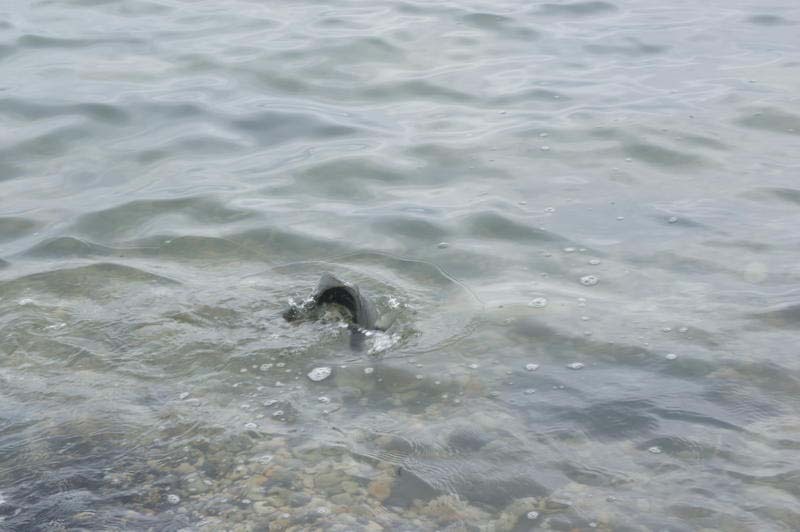 I managed to drag the fish up the shingle, it was big! Having recently weighed and returned a fish that weighed 3lb 10oz I guess this one was well over 6lbs (maybe even 7lb? ), it was really broad across the shoulders and had a very fat head. 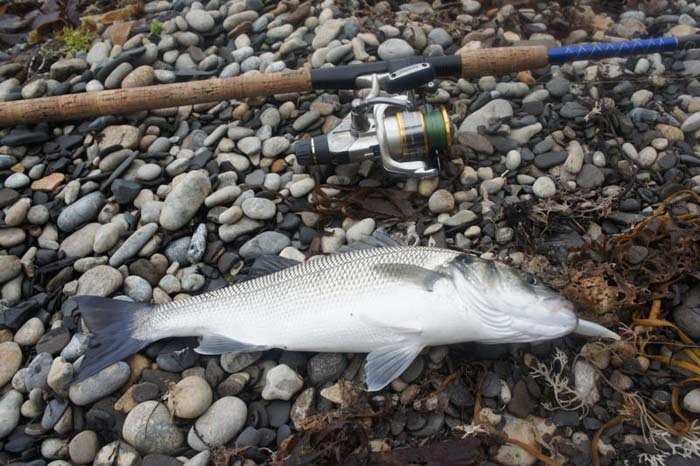 All fish were returned to fight another day, most caught an hour or two before high tide. Am I imagining it or do bigger fish take longer than small fish to recover before they swim off? I held the big fish in the water for ages, it sat there in a trance for about a minute and then with a swish of the tail swam away. I would have caught 15 but I got cocky and was playing a fish with with one hand whilst taking photos with the other when it spat the hook out, that will teach me. I don't currently plan to fish again until Friday & Saturday evenings but I may get the urge before then. Hope to see you on the next set of Springs. Apologies for all the photos. So, Bill and Mike had a beano. 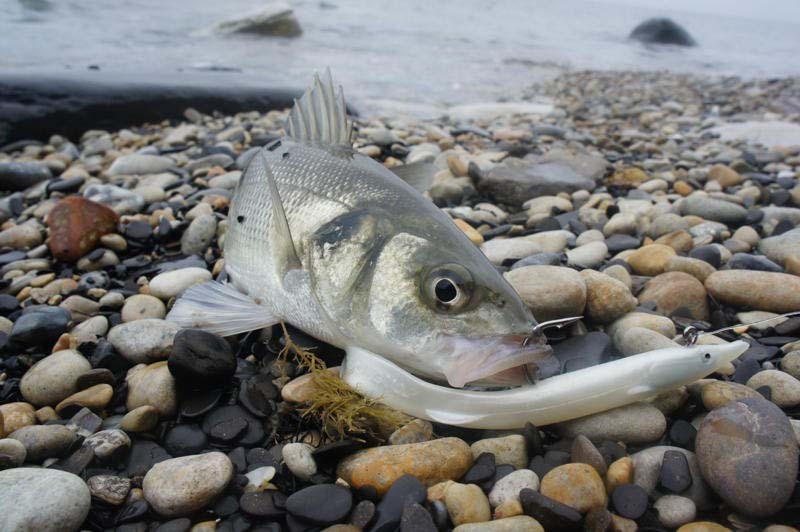 In sessions like that it is easy to catch as many fish as you might get in an entire season's fishing. Anyway, it cheers me up in my debilitated condition to hear about a few fish. I gather that the last lot of spring tides were heaving with mullet but the sea was often too rough and weedy for sensible fishing.Hopefully I'll be fit for the next surge of action.